Ways to reduce logistics costs in Vietnam were once again discussed at a national conference on April 16, showing the strong determination of the government to increase the competitiveness of the economy. 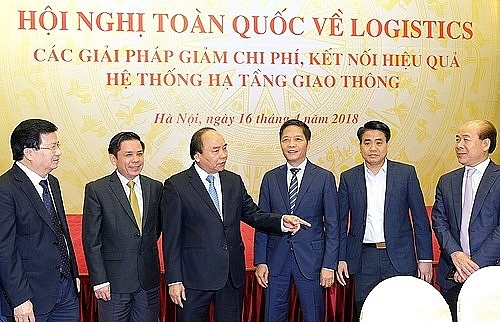 The event revolving around cutting logistics costs and increasing transport connectivity attracted the participation of Prime Minister Nguyen Xuan Phuc, ministers, and hundreds of domestic and international logistics providers. The conference was broadcast live to all cities and provinces nationwide. In his opening remarks, the PM said that though ministries and agencies have been paying attention to logistics, reasonable solutions have not been taken yet to cut down logistics costs that are currently higher than in regional countries. The government leader asked ministries and businesses to focus on dealing with the challenging issues of development planning, infrastructure development, infrastructure connectivity, warehouse development, and business and human resources development. According to Deputy Transport Minister Nguyen Van Cong, despite having an annual growth of 16-20 per cent on average, the industry is facing many challenges. Transport infrastructure is still asynchronous, particularly with a lack of connectivity between seaports, roads, and railway networks as well as post-seaport supporting services. In addition to this lack of connectivity, the asynchronous development of the five transport segments has hindered the development of multi-modal transportation and logistics services. Logistics businesses proposed relevant ministries to further reform administrative procedures and cut unreasonable business conditions to facilitate their activities. "The government should allow investments in the development of more new deepwater seaports and inland container depots (ICDs), while introducing policies to attract cargo for transshipment seaports, improving connectivity among transport segments, as well as ensuring the channel depth at the Cai Mep-Thi Vai port area and others," said Phung Ngoc Minh, vice executive president of Saigon Newport, Vietnam’s largest port operator. "To further facilitate the development of the logistics industry, I is necessary to check overall business conditions so as to remove size-related forcible conditions that hinder businesses from entering the market and the conditions that intervene financially in market-oriented issues, while paying more attention to the training of human resources to meet market development demand," said Tran Thi Lan Anh, vice president of the Vietnam Chamber of Commerce and Industry (VCCI). At the meeting, Prime Minister Nguyen Xuan Phuc stressed the need to drastically reduce transport logistics costs, which would help to enhance the competitiveness of both businesses and the whole economy. He emphasised that the cost burden is the biggest barrier to Vietnamese companies at present, with the high logistic costs affecting the competitiveness of the economy. In that spirit, the PM asked the leaders of ministries and localities to be fully aware of the functions of the logistics industry, which are not only the delivery, reception, and freight of goods, but also include warehousing, storage, packaging, rotation, and handling of damaged goods. He asked participants to focus discussions on removing legal and policy barriers with the optimal goal of reducing transport costs for businesses. He stressed the need for specific action programmes to improve competitiveness and develop logistics services in each sector, especially transport, industry, and trade. He also called for five major task groups, including the finalisation of policies on logistics services, the completion of logistics infrastructure, the enhancement of firms’ capabilities and service quality, the development of the logistics services market, and the enhancement of the quality of human resources. Additionally, logistics companies should proactively apply modern science and technology in order to improve competitiveness, increase the quality of services, and reduce service costs, PM Phuc suggested.